After three years of warring, Congress has finally passed an amendment to the CPSIA. HR 2715 was approved by the Senate this evening by voice vote. 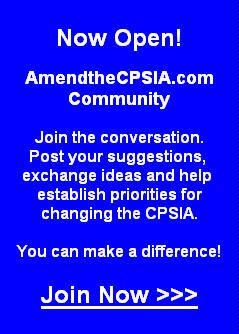 This is expected to be the last legislative relief (thusfar the only legislative) relief from the CPSIA. I have to say, as a lifelong Democrat, this whole CPSIA thing makes me feel incredibly powerful! You have to admit that to be able to, during a deep recession, force the American people to pay the immense administration costs of the CPSC due to the CPSIA, while burying business in mountains of red tape and testing expense, and to do so while EXPLICITLY STATING that they have no obligation to show efficacy and in the face of a huge body of evidence that the CPSIA will accomplish little in terms of real safety is...Powerful! As a registered Democrat I practically feel I am becoming one with the force. You Republicans can join the force too. All you have to do is close your mind, admit that evidence (when it contradicts your cherished gut feelings) is overrated, and join the Democratic Party. Then you too can blatantly screw the American people.